This replica jacket has turned down shirt collar, YKK branded zip closure, full sleeves with open hem cuffs and two waistline pockets. This stylish biker jacket is not only increased glamour in your personality but it is ideal winter attire. Visit here Celebs Leather Jackets. Car boot sale ad details Criss Angel Brown Quilted Biker Leather Jacket for sale in London. 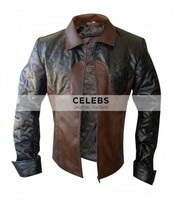 Criss Angel Brown Quilted Biker Leather Jacket available on car boot sale in London. More Coats & parkas for sale in London and more second hand sale ads for free on 2lazy2boot - London car boot fairs - 41666.